← A success disguised as failure? I guess I should announce when I am taking a weekend off – thanks for the emails asking if everything is ok. I just got busy and didn’t have time to get anything together. I cooked some really good food this weekend though, so be watching for that to show up here soon. If you don’t follow me on Twitter or Facebook, you may not have seen my comment that Lauren is back home in Georgia and for all intents and purposes out of the Army. She has a month of leave to use up, then will out-process and be done. We are very proud that both of the girls [and their husbands, incidentally] chose to serve in the military, but not sorry that they are now out. And we got some new buddies! Meet Louie and Rico The names were chosen after intense consulations with our grandson, Mark. Louie [also known for a few months as “Woo-Wee”, until Mark could pronounce his “L”s] is named after the Betta we had until he died in December. Rico seems to be named after one of his Little People, whom you may remember from the Lego Dramas we had here last year when Ellyn and the kids stayed with us while they looked for a house. We had an aquarium a long time ago, when Ellyn was little. 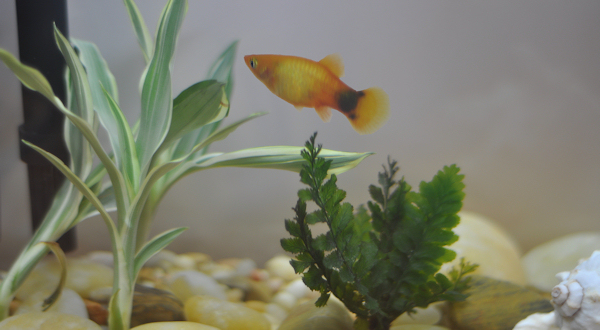 We lost all of the fish after a house fire – they died from the lack of heat in their tank, not from, like, boiling, which would probably put me off owning fish ever again. We put the aquarium away and finally, I gave it to my nephew. But now we have a new one and I am wondering what took so long, because I love watching these guys. Louie and Rico are Mickey Mouse Platies, and they will be joined by more fish in a few days. And I can’t be entirely sure, but I think I may hear them saying something. Only time will tell about that though. They are just cute as buttons. If I were home more I would consider a fish tank. Its so relaxing to watch them. Enjoy! Fish! How fun! Skor is sitting next to our tank watching our fish right now! I just took my dd to the pet store last week, specifically to look at goldfish for her :) Cute names. Weezee – being related to me is reward enough, don’t you think? Trisha – Riley is jealous of the fish – Mom should not talk to the fish! 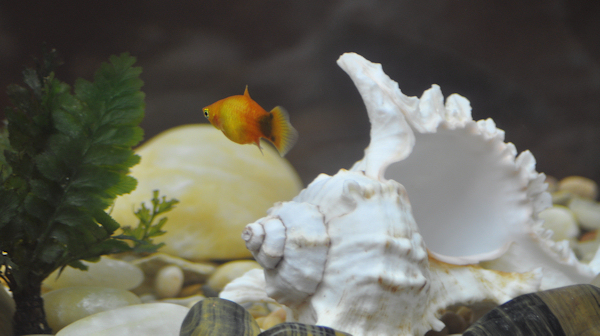 Cam – we have had many a goldfish around here – I love them! I wonder how he knew their names without even meeting them. Smart kid that boy of mine. He gets that from me. I love the “woo wee” comment. It is priceless! is lauren in augusta? If so I’d love to take her to lunch! let me know if shes close by I am less than 3 miles from fort gordon! ohhh ps… we moved our fish outside to the POND I have posted some new pics after the huge rain this weekend. http://peach867.blogspot.com I LOVE fishes! 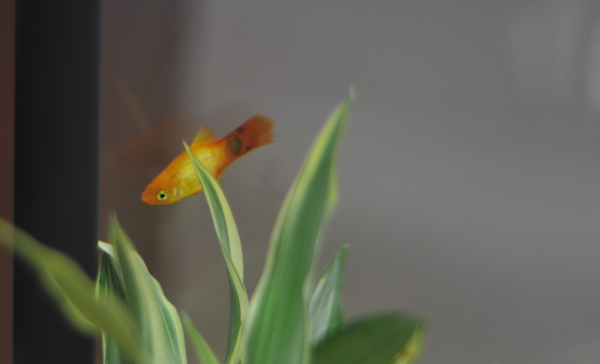 my mom always loved her fish tanks and I liked watching them chase each other around – playful. she always said it was peaceful. Oh I have no doubt that any fish living in your house will soon be interviewed! I look forward to it! And just so ya know …. it may be Woo-Wee for a long time. Emily could not say her Ls or Rs until she was about 10, I think. We would work with her and work with her … slowly repeating after us …. but as soon as she would say the word fast it was “wun” for run and “waff” for laugh. It was so cute. Never fear, she will graduate in a few weeks from college with honors! The fish are very pretty. I have been debating about going all out with the tropical fish thing as a project for Nathaniel and me. I know if we start, we have to keep it up and keep it clean. We go to the pet store and look at fish all the time. That Daryl certainly knows her trivia! Purty fish there! Sorry Daryl- that was not the reference I had in mind, as Dobie Gillis was on in the early 60s. So keep trying, people! It’s not that hard – it was only in one episode of the show, but was so funny that it has stuck in my mind all these years. Janis – we won’t get to see Lauren for a couple months probably. I am still getting use to the novelty of being able to call her on the phone, instead of having to wait for her to get access to one. Laura – she is a ways from Augusta – I will check with her to see how far and get back to you via email. CM – the kits aren’t terribly expensive and they stay a lot cleaner than they used to – you still have to change filters and clean and stuff, but it all works better than when we last had a full set up. So very glad she is home. Too bad for your husband he’s gotta go back to WOOOOOORK. But hey, he’s got a job so THAT’S GOOD. 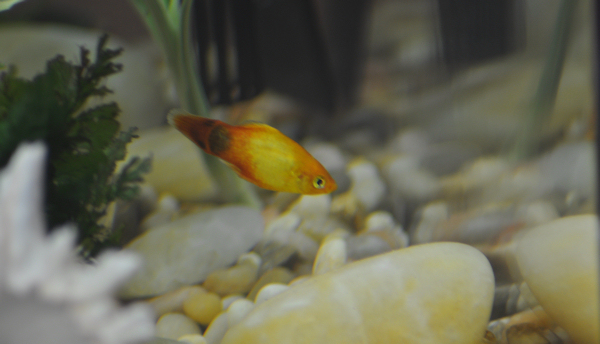 I’m looking forward to lots of fish pics in the future! I thought that Dobie Gillis was late 50’s early 60’s. Maybe I am wrong. I love fish! I have a tank with 2 goldfish. It’s very relaxing to watch them. Mine is named Goldie and Blackie and Pete. Pete is the algae eating thing. Glad your daughter is home. Now you can breath easier. You are going to have so many hours of enjoyment each day from that aquarium. We got one just over a year ago. And recently got a much bigger one. So amazing to watch that little universe inside the glass tank! And it’s so calming. How awesome! A Barney Miller reference! I didn’t know “worrrrrrk” came from it, but I grew up watching… it was a family favorite. Thanks for the flashback!